Daily Illuminator: Ogre Miniatures Set 2 On Kickstarter Now! November 14, 2017: Ogre Miniatures Set 2 On Kickstarter Now! Ogre Miniatures Set 2, the sequel to our highly successful Ogre Miniatures Set 1 campaign, is live on Kickstarter now! This new set expands your Ogre options with seven all-new units. The defenders are bolstered by the fast support of the Light Tank and Light G.E.V., while getting some heavy artillery with the Superheavy Tank and Mobile Howitzer. Infantry is also included, and has a faster way around the battlefield: the G.E.V. Transport. But all of these are ants in comparison to the two big miniatures in Set 2: the Fencer and the Ogre Mk. IV. The Fencer comes with two turrets, giving you the choice of building it in an A or B configuration. The Ogre Mark IV is another step in the Ogre evolution, faster than most Ogres and armed with long-reaching missiles. Due to the high demand for multiple sets, and our constant quest to get fans more minis for the money, our $75 reward level will include three full sets of miniatures, in red attackers/blue defenders, reverse colors, and hunter green, which comes out to over 150 miniatures! 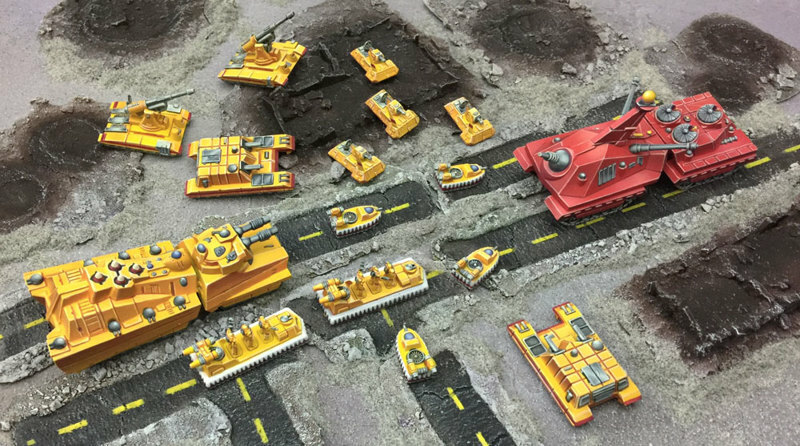 Of course, if you're building a really big army, we have options for even more . . . so check out the Kickstarter and muster your forces. And for those looking for painting inspiration, we talked to Ben Williams, our in-house painter, about the amazing paint jobs he's done; we showed off some of his models on #SJGamesLive . . . give it a look. Ogre Miniatures Set 1 was also featured on GTM's Happy Li'l Minis show, for even more painting fun! And if you're interested in other Ogre content, check out our most recent Ogrezine additions - three new articles, to be exact! Note that this is a short campaign, ending November 27, so make sure you back soon!